Now, we're not about to announce breaking news or anything -- but we had never noticed this (we're pretty disappointed in ourselves), and we want to keep you informed. Wait for it. 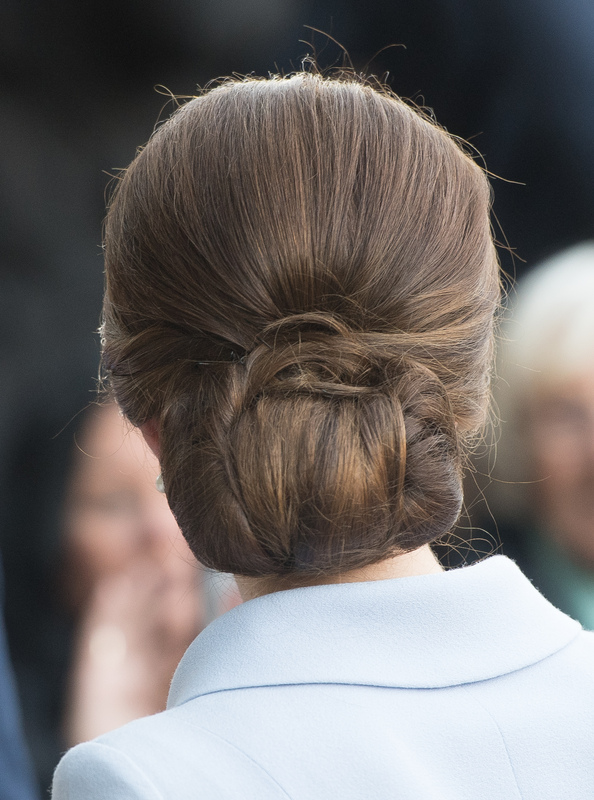 Kate Middleton wears hairnets to keep her perfect updos in place. 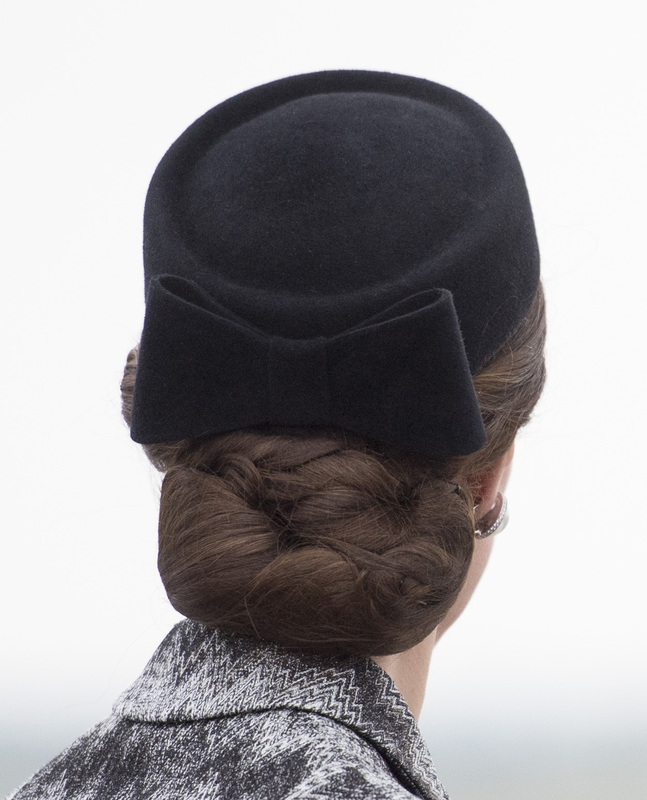 If you happened to catch photos of the Duchess in the Netherlands Wednesday (or if you heard about her plane surprise), then you also saw her impeccable chignon (and maybe wondered how she kept it so impeccable). Catherine, Duchess of Cambridge arrives at the Mauritshuis to view the exhibition 'At Home in Holland: Vermeer and his Contemporaries from the British Royal Collection' on October 11, 2016 in The Hague, Netherlands. Catherine, Duchess of Cambridge visits Bouwkeet, the social Makerspace of Bospolder-Tussendijken on October 11, 2016 in The Hague, Netherlands. Catherine, Duchess of Cambridge views the 'Girl with a Pearl Earring' by Johannes Vermeer as she visits the Mauritshuis Gallery during a solo visit to the Hague on October 11, 2016 in the Hague, Netherlands. Catherine, Duchess of Cambridge visits the Mauritshuis to view the exhibition 'At Home in Holland: Vermeer and his Contemporaries from the British Royal Collection' on October 11, 2016 in The Hague, Netherlands. Britain's Catherine, Duchess of Cambridge meets pupils in a woollen class at Bouwkeet workshop project for teenagers, in Rotterdam Netherlands October 11, 2016. Britain's Catherine, Duchess of Cambridge attends a 'bike-building' class at Bouwkeet workshop project for teenagers, Netherlands October 11, 2016. Britain's Catherine, Duchess of Cambridge attends a robotics class at Bouwkeet workshop project for teenagers, Netherlands October 11, 2016. Britain's Catherine, Duchess of Cambridge, leaves Bouwkeet, the social Makerspace of Bospolder-Tussendijken, a community education and technology project in Rotterdam, in the Netherlands October 11, 2016. Britain's Catherine, the Duchess of Cambridge, visits the historic Mauritshuis Museum in The Hague's city centre, where she viewed 22 paintings by Dutch masters on loan from the British Royal Collection as part of a current exhibition on October 11, 2016. The Duchess of Cambridge, affectionally known as Kate, made her first solo official trip abroad with a day-long visit to The Netherlands, seen as part of a British charm offensive after the Brexit vote. Britain's Catherine, Duchess of Cambridge, leaves with museum director Emilie Gordenke after viewing the exhibition "At Home in Holland: Vermeer and his Contemporaries from the British Royal Collection", at the Mauritshuis Art Museum in the Hague, the Netherlands October 11, 2016. Catherine, Duchess of Cambridge meets King Willem Alexander of the Netherlands at Villa Eikenhorst in The Hague, Netherlands, October 11, 2016. Britain's Catherine, the Duchess of Cambridge, rides an elevator following her visit to the historic Mauritshuis Museum in The Hague's city centre, where she viewed 22 paintings by Dutch masters on loan from the British Royal Collection as part of a current exhibition on October 11, 2016. Catherine, Duchess of Cambridge visits the Mauritshuis Gallery during a solo visit to the Hague on October 11, 2016 in the Hague, Netherlands. Mauritshuis Director Emilie Gordenker shows Catherine, Duchess of Cambridge the 'The Goldfinch' by Carel Fabritius as she visits the Mauritshuis Gallery during a solo visit to the Hague on October 11, 2016 in the Hague, Netherlands. Britain's Catherine, Duchess of Cambridge greets people as she leaves after visiting the exhibition 'Vermeer and Contemporaries from the British Royal Collection' at The Mauritshuis art museum - home to the best of Dutch Golden Age painting, in The Hague, the Netherlands, on October 11, 2016. Britain's Catherine, Duchess of Cambridge is on her first official foreign solo visit. Catherine, Duchess of Cambridge meets King Willem Alexander of the Netherlands at Villa Eikenhorst on October 11, 2016 in The Hague, Netherlands. Pretty flawless, right? And as Cosmopolitan suspects, it looks like she has a hairnet to thank again. Her trick was first noticed this past summer when, according to the Daily Mail, everyone started clamoring for old-fashioned hairnets after the royal mom was spotted wearing one in France. We're guessing the demand just skyrocketed again. If you're in the market for one, Amazon has quite the selection.